SNMP4J is an enterprise class, free open source, and state-of-the-art SNMP v1/2c/v3 implementation for Java™. 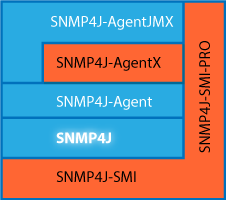 SNMP4J is the core API for implementing any SNMP service. SNMPv3 with MD5 and SHA authentication and DES, 3DES, AES 128, AES 192, and AES 256 privacy. Pluggable Message Processing Models with implementations for MP v1-4. Pluggable transport mappings. UDP, TCP, and (D)TLS are supported for IPv4 and IPv6 out-of-the-box. Command generator as well as command responder support. Free open source with the Apache license model. Java™ 6 or later (Java™ 9 for version 3.0 or later). Row-based efficient asynchronous table retrieval with GETBULK. Seamless integration of MIB data through SNMP4J-SMI-PRO. Log adapter for multi logging framework support. Diffie Hellman key exchange (RFC 2768). Command line tool for sending SNMP requests.